Late spring is a wonderful time in your polytunnel garden. Plenty of produce is growing nicely and you can begin to harvest a wide range of salad crops now that the warmer weather is finally beginning to arrive. At this time of year, you may not yet have access to summer crops, but there is plenty of early, swift-growing produce to choose from, for fresh, zesty flavours that you can enjoy straight from the ground to your plate. Spring is a time when green, leafy vegetables become abundant. 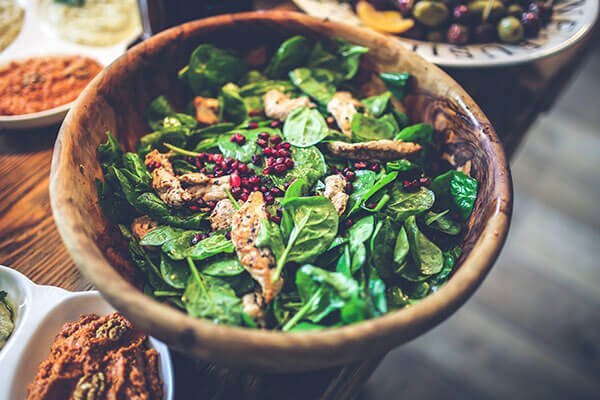 You may be able to harvest a bounty of lettuce, Asian greens, rocket, herbs and baby spinach leaves for flavoursome and versatile spring green salads that can be enjoyed as a side dish or the main attraction. Keep things simple and show off the peppery, simple flavours of a variety of green leaves with a classic vinaigrette. Egg salad does not have to be the boiled egg and mayonnaise concoction with which we are all overly familiar. Knock up a sophisticated boiled egg salad with a honey-mustard dressing. Toss in all the fresh flavours of spring greens, spring onions and spicy radishes for a delicious dish that is perfect for a lunch or light mid-week supper. If you like spice, whip up a dressing of nut butter, chilli, garlic and lemongrass and create a Thai-inspired salad. Mix with grated carrot, early courgettes, mangetout peas and whichever fresh greens you have to hand for something a little out of the ordinary. This creates a delicious Waldorf-like salad. For something a little more substantial, you could consider whipping up a pasta salad, using sweet, delicious mange-tout peas or sugar snaps, and adding flavour with a variety of zesty herbs such as fennel and dill, perhaps with a creamy cream-cheese base. There is nothing better than eating a fresh salad that was in the ground just minutes before. Healthy, wholesome and satisfying, salads you have grown yourself in your polytunnel come in a wide range of different shapes and sizes – springtime salads definitely don’t have to be boring! Stay healthy but keep things interesting, and make a variety of salads to make the most of the delicious produce that you grow in your polytunnel garden.